Does My Boss Have To Give Me A Lunch Break? I drive a metropolitan bus. I work 8 hour shifts and in these shifts my schedule is supposed to give me 15 to 20 breaks at the end of each run. For example, my bus runs start at10 a.m. and ends at 10:45 and the next run starts11 a.m. However, sometimes there's traffic and I arrive at 11:05 a.m. So, I am late and need to continue on my bus run to stay on schedule. At the end on my day, sometimes I do not even get a lunch because of traffic. Is this legal not to have a lunch? Lots of people think there's a federal law requiring certain breaks during the day such as coffee and lunch breaks. Those people are wrong. There is no federal law requiring any breaks at work. Union agreement: If you have a union, then check the collective bargaining agreement. The union may well have negotiated a breaks requirement. If you don't have a union and the company isn't allowing breaks, then maybe it's time to start one. For information on how to start a union, try this link to the AFL-CIO that can get you started. If you ever wondered how people decide to start unions, this is a good example. Abusive employer practices can cause employees to start organizing. Meal breaks: Only 20 states require any meal breaks. California, Colorado, New Hampshire, North Dakota and Washington require 1/2 hour within five hours of work. Connecticut and Delaware require ½ hour after first 2 hours and before last 2 hours for employees who work 7½ consecutive hours or more. 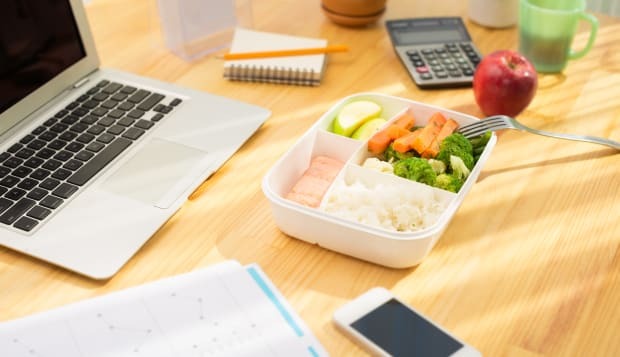 Illinois, Kentucky, Maine, Massachusetts, Minnesota, Nebraska, Nevada, New York, Oregon, Rhode Island, Tennessee, Vermont and West Virginia all have laws about meal breaks. In the other 30 states, employers are allowed to starve you. These laws change from time to time, so check with an employment lawyer in your state about your rights. Rest breaks: Only nine states require any rest breaks. California, Colorado, Kentucky, Nevada, Oregon and Washington require 10 minute breaks for every 4 hours of work. Minnesota and Vermont require reasonable bathroom breaks. Illinois also has rest break requirements but only for hotel attendants. All of these states also require meal breaks. Employment agreement: If you have an employment agreement, it may deal with rest breaks. Odds are you don't have one, but if you do, check it out. If you're an employer that doesn't give employees any breaks, please rethink your policies. Employees who are tired and hungry can't give you their all. Plus, you may motivate them to unionize or take other concerted action with coworkers to change things. If you work for an abusive employer, now is the time to start looking for another job or start organizing your coworkers to try to get things to change for the better. If you have a state law on breaks that they're violating, contact an employee-side employment lawyer in your state about your rights.